We are operating at a stage in design and manufacturing where 3D models are used for direct tooling, or used to generate injection molds, but still need to be supplemented by 2D drawings for PMI (dimensions, tolerances and notes). In addition to creating extra work, 2D drawings are fundamentally flawed because the interpretation is limited to 2D, rather than real hardware which is 3D. I realize we have grown accustom to 2D drawings in the workplace, but these orthographic projections of 3D data are limiting both in creation of un-ambiguous product definition and will castrate the performance of high-tech manufacturing processes, such as Additive Manufacturing (AM). 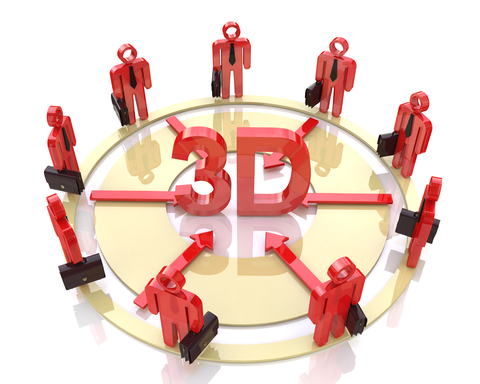 3D Collaboration and the Digital Thread requires all stakelholders to partipate in the descision making process. So… what is on the engineering horizon, and how can you step out of the 2D inertia spiral of death (a little Halloween humor for you)? Conceptually MBE = Digital Thread. I have made over 10 presentations on this subject to various organizations in the past 3 months and have discovered that the term “Digital Thread” is probably more accurate to describe the data throughput, but misses the “Enterprise” functions required to successfully implement the Digital Thread. Call it what you will, the concepts are sound. Quality and Inspection downstream consumption challenges as well as opportunities are now in the forefront of the MBE conversation. Sometimes, they are discussed as yet another excuse NOT to do MBD and MBE, but if we can get over that, the payoffs will be huge. Find out more about these exciting topics including challenges, pitfalls, strategies and solutions by attending the upcoming 3D Collaboration and Interoperability Congress. 11:10 a.m. Rich Eckenrode, President & Principal Consultant, RECON Services Incorporated [Bio] – How do you rate in MBE? 11:40 a.m. John Schmelzle, Mechanical Engineer, NAVAIR [Bio] – What Does MBD look like for Organic Engineering in the U.S. Navy? This entry was posted on Monday, October 19th, 2015 at 6:39 PM. You can follow any responses to this entry through the RSS 2.0 feed. You can leave a response, or trackback from your own site.